Some people collect toy cars. Some people even collect real cars. Jacques Littlefield wasn't all that interested. He collected tanks. Littlefield didn't want to launch an invasion, he just thought tanks were interesting. The majority of his collection, housed near San Francisco, will be sold off next month by Auctions America. In order to legally own most of these vehicles he had to "demilitarize" them, rendering them incapable of firing real ammunition. A few are still fully capable weapons, requiring special permits. Still, his collection looks entirely lethal. By the time he passed away in 2009, Littlefield had gathered almost 250 military vehicles, ranging from pretty big to really enormous. 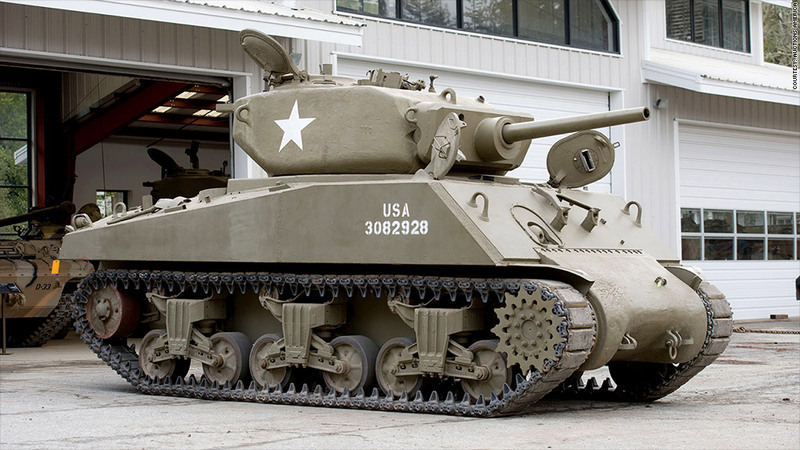 Among the items available for purchase is this 42-ton American Sherman tank, a modified version of a smaller Sherman. Built with thicker armor and a heavier turret, it was intended for attacks against German fortifications late in World War II. More than 250 of these tanks were built, but only seven or eight are believed to survive today. It failed to sell at the auction because the sellers were holding out for an even higher price.